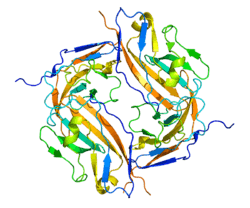 CD47 (Cluster of Differentiation 47) also known as integrin associated protein (IAP) is a transmembrane protein that in humans is encoded by the CD47 gene. CD47 belongs to the immunoglobulin superfamily and partners with membrane integrins and also binds the ligands thrombospondin-1 (TSP-1) and signal-regulatory protein alpha (SIRPα). CD47 is involved in a range of cellular processes, including apoptosis, proliferation, adhesion, and migration. Furthermore, it plays a key role in immune and angiogenic responses. CD47 is ubiquitously expressed in human cells and has been found to be overexpressed in many different tumor cells. Expression in equine cutaneous tumors has been reported as well. CD47 is a 50 kDa membrane receptor that has extracellular N-terminal IgV domain, five transmembrane domains, and a short C-terminal intracellular tail. There are four alternatively spliced isoforms of CD47 that differ only in the length of their cytoplasmic tail. Form 2 is the most widely expressed form that is found in all circulating and immune cells. The second most abundant isoform is form 4, which is predominantly expressed in the brain and in the peripheral nervous system. Only keratinocytes expressed significant amounts of form 1. Little is known about the functional significance of this alternative splicing. However, these isoforms are highly conserved between mouse and man, suggesting an important role for the cytoplasmic domains in CD47 function. CD47 is a high affinity receptor for thrombospondin-1 (TSP-1), a secreted glycoprotein that plays a role in vascular development and angiogenesis, and in this later capacity the TSP1-CD47 interaction inhibits nitric oxide signaling at multiple levels in vascular cells. Binding of TSP-1 to CD47 influences several fundamental cellular functions including cell migration and adhesion, cell proliferation or apoptosis, and plays a role in the regulation of angiogenesis and inflammation. CD47 interacts with signal-regulatory protein alpha (SIRPα), an inhibitory transmembrane receptor present on myeloid cells. The CD47/SIRPα interaction leads to bidirectional signaling, resulting in different cell-to-cell responses including inhibition of phagocytosis, stimulation of cell-cell fusion, and T-cell activation. CD47 interacts with several membrane integrins, most commonly integrin avb3. These interactions result in CD47/integrin complexes that affect a range of cell functions including adhesion, spreading and migration. Due to the ubiquitous expression of CD47, signaling differs according to cell type. It is likely that intracellular and membrane-associated partners are crucial in determining the cellular response of CD47 signaling. The role of CD47 in promoting cell proliferation is heavily dependent on cell type as both activation and loss of CD47 can result in enhanced proliferation. Activation of CD47 with TSP-1 increases proliferation of human U87 and U373 astrocytoma cells but not normal astrocytes. Additionally, CD47 blocking antibodies inhibit proliferation of unstimulated astrocytoma cells but not normal astrocytes. Though the exact mechanism is unclear, it is likely that CD47 promotes proliferation via the PI3K/Akt pathway in cancerous cells but not normal cells. Loss of CD47 allows sustained proliferation of primary murine endothelial cells and enables these cells to spontaneously reprogram to form multipotent embryoid body-like clusters. Expression of several stem cell markers, including c-Myc, is elevated in CD47-null endothelial cells and a human T cell line lacking CD47. Activation of CD47 with TSP-1 in wild-type cells inhibits proliferation and reduces expression of stem cell transcription factors. CD47 ligation leads to cell death in many normal and tumor cell lines via apoptosis or autophagy. The activation of CD47 induces rapid apoptosis of T cells. Jurkat cells and peripheral blood mononuclear cells (PBMC) incubated with the monoclonal antibody Ad22 results in apoptosis within 3 hours. However, apoptosis was not observed following culture with other anti-CD47 antibodies. The apoptosis inducing function of CD47 appears to be dependent on activation of specific epitopes on the extracellular domain. Similarly, CD47 ligation rapidly induces apoptosis in B-cell chronic lymphocytic leukemia (CLL) cells. Treatment with a disulfide-linked antibody dimer induces apoptosis of CD47-positive primary B-CLL and leukemic cells (MOLT-4 and JOK-1). In addition, administration of the antibody prolonged survival of SCID mice implanted with JOK-1 cells. Apoptosis induction appears to be regulated by the hypoxia inducible factor 1α (HIF-1α) pathway. The RAS-transformed cell lines MDFB6 and B6ras show near complete loss of TSP-1 expression. Activation of CD47 with TSP-1 results in loss of viability in these RAS-expressing cells. Affected cells do not exhibit hallmarks of apoptosis but rather autophagy as seen by staining with acridine orange and immunoreactivity for LC3. Cell migration appears to be universally stimulated by CD47 ligation and activation. The role of CD47 in cell migration was first demonstrated for neutrophils, where CD47 blocking antibodies inhibited transmigration of neutrophils and monocytes through the endothelium. These effects were shown to be dependent on avb3 integrins, which interact with and are activated by CD47 at the plasma membrane. Blocking CD47 function has been shown to inhibit migration and metastasis in a variety of tumor models. Blockade of CD47 by neutralizing antibodies reduced migration and chemotaxis in response to collagen IV in melanoma, prostate cancer and ovarian cancer-derived cells. In a mouse model of multiple myeloma, tumor metastasis to bone was decreased in CD47-deficient mice compared with wild type controls. In mice xenografted with human non-Hodgkin lymphoma (NHL) cells, blocking CD47 function with shRNA or antibodies led to a dramatic reduction in metastasis to major organs. Loss of CD47 promotes proliferation and increases asymmetric division of primary murine endothelial cells. Additionally, activation of CD47 with TSP-1 in wild-type primary mouse cerebral endothelial cells induces cytotoxicity, which is significantly decreased in cerebral endothelial cells derived from CD47 knockout mice. CD47 signaling may suppress angiogenesis as TSP-1 activation significantly inhibited endothelial cell migration and tube formation in vitro. In vivo, injections of TSP-1 in mice after hindlimb ischemia induces a significant decrease of blood flow recovery. The mechanism of the anti-angiogenic activity of CD47 is not fully understood, but introduction of CD47 antibodies and TSP-1 have been shown to inhibit nitric oxide (NO)-stimulated responses in both endothelial and vascular smooth muscle cells. CD47 signaling influences the SDF-1 chemokine pathway, which plays a role in angiogenesis. Interactions between endothelial cell CD47 and leukocyte SIRPγ regulate T cell transendothelial migration (TEM) at sites of inflammation. CD47 knockout mice show reduced recruitment of blood T cells as well as neutrophils and monocytes in areas of inflammation. CD47 also functions as a marker of self on murine red blood cells which allows RBC to avoid phagocytosis. Red blood cells that lack CD47 are rapidly cleared from the bloodstream by macrophages, a process that is mediated by interaction with SIRPα. Mouse hematopoietic stem cells (HSCs) and progenitors transiently upregulate CD47 during their migratory phase, which reduces macrophage engulfment in vivo. Tumor cells can also evade macrophage phagocytosis through the expression of CD47. CD47 is highly expressed in bladder tumor initiating cells (T-ICs) compared with the rest of the tumor. Blockade of CD47 with a monoclonal antibody results in macrophage engulfment of bladder cancer cells in vitro. CD47 is also upregulated in mouse and human myeloid leukemias, and overexpression of CD47 on a myeloid leukemia line allows these cells to evade phagocytosis. CD47 was first identified as a tumor antigen on human ovarian cancer in the 1980s. Since then, CD47 has been found to be expressed on multiple human tumor types including acute myeloid leukemia (AML), chronic myeloid leukemia, acute lymphoblastic leukemia (ALL), non-Hodgkin’s lymphoma (NHL), multiple myeloma (MM), bladder cancer, and other solid tumors. High levels of CD47 allows cancer cells to avoid phagocytosis despite having a higher level of calreticulin - the dominant pro-phagocytic signal. This is due to engage of the SIRP-α of macrophage by CD47. Engagement of SIRP-α leads to inhibition of phagocytosis. Thus blocking CD47 with antibody turns off “don’t eat me” signal and favors phagocytosis. Anti-CD47 antibody–mediated phagocytosis of cancer by macrophages can initiate an antitumor T-cell immune response. Noteworthy, anti-CD47 antibody treatment not only enables macrophage phagocytosis of cancer, but also fosters the activation of cancer-specific lymphocytes: cancer cells now display mutant proteins to which the immune system can react. ↑ "Entrez Gene: CD47 CD47 molecule". 1 2 3 4 5 6 7 Sick E, Jeanne A, Schneider C, Dedieu S, Takeda K, Martiny L (December 2012). "CD47 update: a multifaceted actor in the tumour microenvironment of potential therapeutic interest". Br. J. Pharmacol. 167 (7): 1415–30. doi:10.1111/j.1476-5381.2012.02099.x. PMID 22774848. 1 2 3 Chao MP, Weissman IL, Majeti R (April 2012). "The CD47-SIRPα pathway in cancer immune evasion and potential therapeutic implications". Curr. Opin. Immunol. 24 (2): 225–32. doi:10.1016/j.coi.2012.01.010. PMC 3319521 . PMID 22310103. ↑ Caston, Stephanie; Cooper, Elizabeth; Chandramani-Shivalingappa, Prashanth; Sponseller, Brett; Hostetter, Jesse; Sun, Yaxuan (July 2016). "CD47 expression in cryopreserved equine cutaneous masses and normal skin". Journal of Veterinary Diagnostic Investigation. 28 (4): 408–413. doi:10.1177/1040638716643352. PMID 27154320. 1 2 Reinhold MI, Lindberg FP, Plas D, Reynolds S, Peters MG, Brown EJ (November 1995). "In vivo expression of alternatively spliced forms of integrin-associated protein (CD47)". J. Cell. Sci. 108 (Pt 11): 3419–25. PMID 8586654. ↑ Frazier WA, Isenberg JS, Kaur S, Roberts DD (February 2010). "CD47". UCSD Nature Molecule Pages. doi:10.1038/mp.a002870.01. 1 2 Isenberg JS, Ridnour LA, Dimitry J, Frazier WA, Wink DA, Roberts DD (September 2006). "CD47 is necessary for inhibition of nitric oxide-stimulated vascular cell responses by thrombospondin-1". J. Biol. Chem. 281 (36): 26069–80. doi:10.1074/jbc.M605040200. PMID 16835222. ↑ Barclay AN (February 2009). "Signal regulatory protein alpha (SIRPα)/CD47 interaction and function". Curr. Opin. Immunol. 21 (1): 47–52. doi:10.1016/j.coi.2009.01.008. PMC 3128989 . PMID 19223164. 1 2 3 Brown EJ, Frazier WA (March 2001). "Integrin-associated protein (CD47) and its ligands". Trends Cell Biol. 11 (3): 130–5. doi:10.1016/S0962-8924(00)01906-1. PMID 11306274. ↑ Sick E, Boukhari A, Deramaudt T, Rondé P, Bucher B, André P, Gies JP, Takeda K (February 2011). "Activation of CD47 receptors causes proliferation of human astrocytoma but not normal astrocytes via an Akt-dependent pathway". Glia. 59 (2): 308–19. doi:10.1002/glia.21102. PMID 21125662. 1 2 Kaur S, Soto-Pantoja DR, Stein EV, Liu C, Elkahloun AG, Pendrak ML, Nicolae A, Singh SP, Nie Z, Levens D, Isenberg JS, Roberts DD (April 2013). "Thrombospondin-1 Signaling through CD47 Inhibits Self-renewal by Regulating c-Myc and Other Stem Cell Transcription Factors". Sci Rep. 3: 1673. doi:10.1038/srep01673. PMC 3628113 . PMID 23591719. ↑ Pettersen RD, Hestdal K, Olafsen MK, Lie SO, Lindberg FP (June 1999). "CD47 signals T cell death". J. Immunol. 162 (12): 7031–40. PMID 10358145. ↑ Sagawa M, Shimizu T, Fukushima N, Kinoshita Y, Ohizumi I, Uno S, Kikuchi Y, Ikeda Y, Yamada-Okabe H, Kizaki M (June 2011). "A new disulfide-linked dimer of a single-chain antibody fragment against human CD47 induces apoptosis in lymphoid malignant cells via the hypoxia inducible factor-1α pathway". Cancer Sci. 102 (6): 1208–15. doi:10.1111/j.1349-7006.2011.01925.x. PMID 21401803. ↑ Kalas W, Swiderek E, Switalska M, Wietrzyk J, Rak J, Strzadala L (April 2013). "Thrombospondin-1 Receptor Mediates Autophagy of RAS-expressing Cancer Cells and Triggers Tumour Growth Inhibition". Anticancer Res. 33 (4): 1429–38. PMID 23564783. ↑ Shahan TA, Fawzi A, Bellon G, Monboisse JC, Kefalides NA (February 2000). "Regulation of tumor cell chemotaxis by type IV collagen is mediated by a Ca(2+)-dependent mechanism requiring CD47 and the integrin alpha(V)beta(3)". J. Biol. Chem. 275 (7): 4796–802. doi:10.1074/jbc.275.7.4796. PMID 10671513. ↑ Uluçkan O, Becker SN, Deng H, Zou W, Prior JL, Piwnica-Worms D, Frazier WA, Weilbaecher KN (April 2009). "CD47 regulates bone mass and tumor metastasis to bone". Cancer Res. 69 (7): 3196–204. doi:10.1158/0008-5472.CAN-08-3358. PMC 2763641 . PMID 19276363. ↑ Chao MP, Tang C, Pachynski RK, Chin R, Majeti R, Weissman IL (November 2011). "Extranodal dissemination of non-Hodgkin lymphoma requires CD47 and is inhibited by anti-CD47 antibody therapy". Blood. 118 (18): 4890–901. doi:10.1182/blood-2011-02-338020. PMC 3208297 . PMID 21828138. 1 2 Xing C, Lee S, Kim WJ, Wang H, Yang YG, Ning M, Wang X, Lo EH (August 2009). "Neurovascular effects of CD47 signaling: promotion of cell death, inflammation, and suppression of angiogenesis in brain endothelial cells in vitro". J. Neurosci. Res. 87 (11): 2571–7. doi:10.1002/jnr.22076. PMID 19360900. 1 2 Smadja DM, d'Audigier C, Bièche I, Evrard S, Mauge L, Dias JV, Labreuche J, Laurendeau I, Marsac B, Dizier B, Wagner-Ballon O, Boisson-Vidal C, Morandi V, Duong-Van-Huyen JP, Bruneval P, Dignat-George F, Emmerich J, Gaussem P (March 2011). "Thrombospondin-1 is a plasmatic marker of peripheral arterial disease that modulates endothelial progenitor cell angiogenic properties". Arterioscler. Thromb. Vasc. Biol. 31 (3): 551–9. doi:10.1161/ATVBAHA.110.220624. PMID 21148423. ↑ Azcutia V, Stefanidakis M, Tsuboi N, Mayadas T, Croce KJ, Fukuda D, Aikawa M, Newton G, Luscinskas FW (September 2012). "Endothelial CD47 promotes vascular endothelial-cadherin tyrosine phosphorylation and participates in T cell recruitment at sites of inflammation in vivo". J. Immunol. 189 (5): 2553–62. doi:10.4049/jimmunol.1103606. PMID 22815286. ↑ Oldenborg PA, Zheleznyak A, Fang YF, Lagenaur CF, Gresham HD, Lindberg FP (June 2000). "Role of CD47 as a marker of self on red blood cells". Science. 288 (5473): 2051–4. doi:10.1126/science.288.5473.2051. PMID 10856220. 1 2 Jaiswal S, Jamieson CH, Pang WW, Park CY, Chao MP, Majeti R, Traver D, van Rooijen N, Weissman IL (July 2009). "CD47 is upregulated on circulating hematopoietic stem cells and leukemia cells to avoid phagocytosis". Cell. 138 (2): 271–85. doi:10.1016/j.cell.2009.05.046. PMC 2775564 . PMID 19632178. ↑ Chan KS, Espinosa I, Chao M, Wong D, Ailles L, Diehn M, Gill H, Presti J, Chang HY, van de Rijn M, Shortliffe L, Weissman IL (August 2009). "Identification, molecular characterization, clinical prognosis, and therapeutic targeting of human bladder tumor-initiating cells". Proc. Natl. Acad. Sci. U.S.A. 106 (33): 14016–21. doi:10.1073/pnas.0906549106. PMC 2720852 . PMID 19666525. ↑ Chao MP, Jaiswal S, Weissman-Tsukamoto R, Alizadeh AA, Gentles AJ, Volkmer J, Weiskopf K, Willingham SB, Raveh T, Park CY, Majeti R, Weissman IL (December 2010). "Calreticulin is the dominant pro-phagocytic signal on multiple human cancers and is counterbalanced by CD47". Sci Transl Med. 2 (63): 63ra94. doi:10.1126/scitranslmed.3001375. PMC 4126904 . PMID 21178137. ↑ Tseng D, Volkmer JP, Willingham SB, Contreras-Trujillo H, Fathman JW, Fernhoff NB, Seita J, Inlay MA, Weiskopf K, Miyanishi M, Weissman IL (July 2013). "Anti-CD47 antibody-mediated phagocytosis of cancer by macrophages primes an effective antitumor T-cell response". Proc. Natl. Acad. Sci. U.S.A. 110 (27): 11103–8. doi:10.1073/pnas.1305569110. PMC 3703977 . PMID 23690610. ↑ Unanue ER (July 2013). "Perspectives on anti-CD47 antibody treatment for experimental cancer". Proc. Natl. Acad. Sci. U.S.A. 110 (27): 10886–7. doi:10.1073/pnas.1308463110. PMC 3704033 . PMID 23784781. Soto Pantoja, D. R., Kaur, S., Miller, T. W., et al. & Roberts, D. D. (2013) Leukocyte surface antigen CD47. UCSD Molecule Pages, 2(1), 19-36. Brown EJ, Frazier WA (2001). "Integrin-associated protein (CD47) and its ligands". Trends Cell Biol. 11 (3): 130–5. doi:10.1016/S0962-8924(00)01906-1. PMID 11306274. Oldenborg PA (2004). "Role of CD47 in erythroid cells and in autoimmunity". Leuk. Lymphoma. 45 (7): 1319–27. doi:10.1080/1042819042000201989. PMID 15359629. Kaczorowski DJ, Billiar TR (2007). "Targeting CD47: NO limit on therapeutic potential". Circ. Res. 100 (5): 602–3. doi:10.1161/01.RES.0000261609.44977.25. PMID 17363705. Campbell IG, Freemont PS, Foulkes W, Trowsdale J (1992). "An ovarian tumor marker with homology to vaccinia virus contains an IgV-like region and multiple transmembrane domains". Cancer Res. 52 (19): 5416–20. PMID 1394148. Brown E, Hooper L, Ho T, Gresham H (1991). "Integrin-associated protein: a 50-kD plasma membrane antigen physically and functionally associated with integrins". J. Cell Biol. 111 (6 Pt 1): 2785–94. doi:10.1083/jcb.111.6.2785. PMC 2116394 . PMID 2277087. Lindberg FP, Gresham HD, Schwarz E, Brown EJ (1993). "Molecular cloning of integrin-associated protein: an immunoglobulin family member with multiple membrane-spanning domains implicated in alpha v beta 3-dependent ligand binding". J. Cell Biol. 123 (2): 485–96. doi:10.1083/jcb.123.2.485. PMC 2119833 . PMID 7691831. Mawby WJ, Holmes CH, Anstee DJ, et al. (1995). "Isolation and characterization of CD47 glycoprotein: a multispanning membrane protein which is the same as integrin-associated protein (IAP) and the ovarian tumour marker OA3". Biochem. J. 304 (Pt 2): 525–30. PMC 1137523 . PMID 7998989. Lindberg FP, Lublin DM, Telen MJ, et al. (1994). "Rh-related antigen CD47 is the signal-transducer integrin-associated protein". J. Biol. Chem. 269 (3): 1567–70. PMID 8294396. Gao AG, Lindberg FP, Finn MB, et al. (1996). "Integrin-associated protein is a receptor for the C-terminal domain of thrombospondin". J. Biol. Chem. 271 (1): 21–4. doi:10.1074/jbc.271.1.21. PMID 8550562. Cherif-Zahar B, Raynal V, Gane P, et al. (1996). "Candidate gene acting as a suppressor of the RH locus in most cases of Rh-deficiency". Nat. Genet. 12 (2): 168–73. doi:10.1038/ng0296-168. PMID 8563755. Chung J, Gao AG, Frazier WA (1997). "Thrombspondin acts via integrin-associated protein to activate the platelet integrin alphaIIbbeta3". J. Biol. Chem. 272 (23): 14740–6. doi:10.1074/jbc.272.23.14740. PMID 9169439. Jiang P, Lagenaur CF, Narayanan V (1999). "Integrin-associated protein is a ligand for the P84 neural adhesion molecule". J. Biol. Chem. 274 (2): 559–62. doi:10.1074/jbc.274.2.559. PMID 9872987. Hermann P, Armant M, Brown E, et al. (1999). "The Vitronectin Receptor and its Associated CD47 Molecule Mediates Proinflammatory Cytokine Synthesis in Human Monocytes by Interaction with Soluble CD23". J. Cell Biol. 144 (4): 767–75. doi:10.1083/jcb.144.4.767. PMC 2132927 . PMID 10037797. Chung J, Wang XQ, Lindberg FP, Frazier WA (1999). "Thrombospondin-1 acts via IAP/CD47 to synergize with collagen in alpha2beta1-mediated platelet activation". Blood. 94 (2): 642–8. PMID 10397731. Mateo V, Lagneaux L, Bron D, et al. (1999). "CD47 ligation induces caspase-independent cell death in chronic lymphocytic leukemia". Nat. Med. 5 (11): 1277–84. doi:10.1038/15233. PMID 10545994. Wu AL, Wang J, Zheleznyak A, Brown EJ (1999). "Ubiquitin-related proteins regulate interaction of vimentin intermediate filaments with the plasma membrane". Mol. Cell. 4 (4): 619–25. doi:10.1016/S1097-2765(00)80212-9. PMID 10549293. Erb L, Liu J, Ockerhausen J, et al. (2001). "An Rgd Sequence in the P2y2 Receptor Interacts with αVβ3 Integrins and Is Required for Go-Mediated Signal Transduction". J. Cell Biol. 153 (3): 491–501. doi:10.1083/jcb.153.3.491. PMC 2190579 . PMID 11331301. Rebres RA, Vaz LE, Green JM, Brown EJ (2001). "Normal ligand binding and signaling by CD47 (integrin-associated protein) requires a long range disulfide bond between the extracellular and membrane-spanning domains". J. Biol. Chem. 276 (37): 34607–16. doi:10.1074/jbc.M106107200. PMID 11454874. Willingham SB, Volkmer JP, Gentles AJ, et al. (2012). "The CD47-signal regulatory protein alpha (SIRPα) interaction is a therapeutic target for human solid tumors". Proc. Natl. Acad. Sci. USA. 109 (17): 6662–7. doi:10.1073/pnas.1121623109. PMC 3340046 . PMID 22451913. Edris B, Weiskopf K, Volkmer AK, et al. (2012). "Antibody therapy targeting the CD47 protein is effective in a model of aggressive metastatic leiomyosarcoma". Proc. Natl. Acad. Sci. USA. 109 (17): 6656–61. doi:10.1073/pnas.1121629109. PMC 3340056 . PMID 22451919. Soto-Pantoja DR, Stein EV, Rogers NM, et al. (2013). "Therapeutic opportunities for targeting the ubiquitous cell surface receptor CD47". Expert Opinion Ther. Targets. 17 (1): 89–103. doi:10.1517/14728222.2013.733699. PMC 3564224 . PMID 23101472. Jiang H, Fu R, Wang H, et al. (2013). "CD47 is expressed abnormally on hematopoietic cells in myelodysplastic syndrome". Leuk. Res. 37 (8): 907–910. doi:10.1016/j.leukres.2013.04.008. PMID 23642736. Zhang Y, Sime W, Juhas M, Sjölander A (June 2013). "Crosstalk between colon cancer cells and macrophages via inflammatory mediators and CD47 promotes tumour cell migration". Eur. J. Cancer. 49 (15): 3320–34. doi:10.1016/j.ejca.2013.06.005. PMID 23810249. Starr JS, Jiang L, Li Z, Qiu Y, Menke DM, Tun HW (June 2013). "CD47 and Osteopontin Expression in Diffuse Large B-cell Lymphoma With Nodal and Intravascular Involvement". Clin Lymphoma Myeloma Leuk. 13 (5): 597–601. doi:10.1016/j.clml.2013.05.001. PMID 23810243. Venkatraman L, Tucker-Kellogg L (May 2013). "The CD47-binding peptide of thrombospondin-1 induces defenestration of liver sinusoidal endothelial cells". Liver Int. 33 (9): 1386–97. doi:10.1111/liv.12231. PMID 23799952.